What is a Margin Utilization and how is it calculated? Where can I track my use of margin? To receive dividends, a client must be present on the shareholders record before a specific date called ex-date. the payable date comes (normally, about one month after the record date) and clients receive dividends on their accounts. However, in some cases, clients might receive the funds with a few days delay due to the necessary time to process the documentation. You should visit Client's area and then indicate accounts and amounts to be transferred. You can also use the desktop trading platform to transfer currencies between sub-accounts. 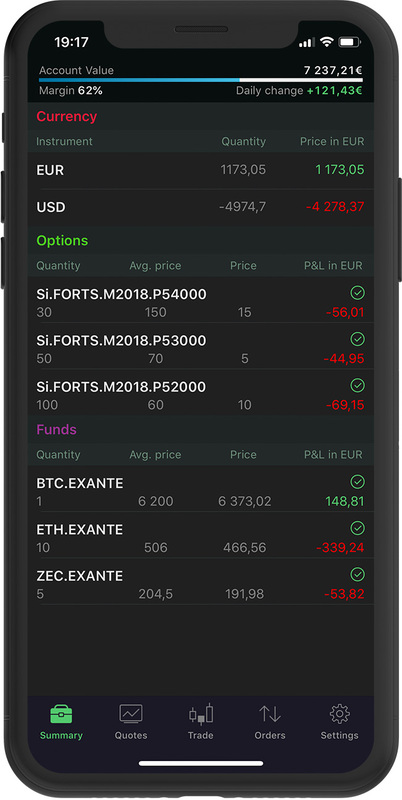 EXANTE automatically opens multi-currency client accounts. Funds can be added in EUR, USD, AUD, CAD, CHF, CNY, GBP, HKD, JPY, MXN, NOK, PLN, RUB, and SEK, and they are stored in the original currency. You can also use an auto conversion feature to proceed with the internal payments in the currencies listed above, as well as with CZK, HUF, NZD, SGD, THB, TRY, or ZAR. That list is subject to change. Please expand the Cash branch in the Instrument Tree in the trading platform to see the full and actual list. When requesting funds withdrawal, our clients can choose to exchange the original currency into any of the above mentioned ones at current market rates. You can also change the default currency of your account at any time. If you trade with leverage, funds can be borrowed in any currency available on the financial markets. The default (basic) currency can be set in EXANTE trading platform or in the Settings section of the Client's area. 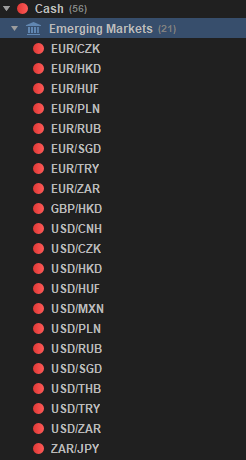 You can change the default currency to EUR, USD, AUD, CAD, CHF, GBP, HKD, JPY, NOK, NZD, PLN, RUB, SEK, or TRY. It is your duty to handle your own tax obligation regardless of your tax residence country. We will provide you with all necessary reports, but you will have to communicate with your tax authorities yourself. Please make sure that you stick to the tax requirements applied to you. For more information on where to find the reports necessary for taxation purposes, please visit this page. You can keep track of your account in several different ways. 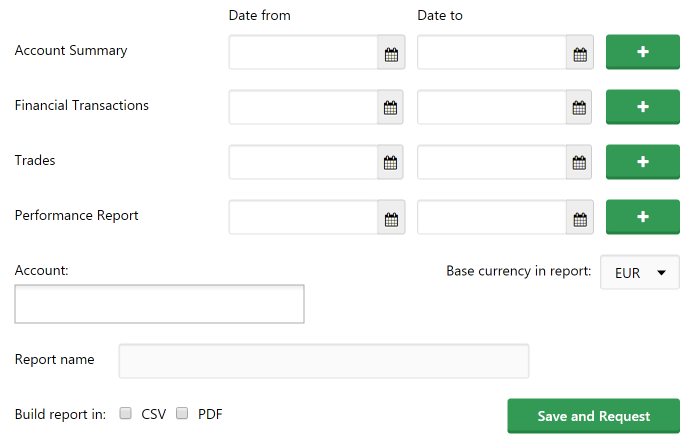 The first and the easiest one is to visit the Account Summary section in your Client's area on EXANTE website. There you will see the main account parameters with P&L changing in real time. You can choose any date to view historic data. One more way to monitor your account is via our mobile applications. They allow you to stay up-to-date, no matter what device you are on. If your tax authorities require an official paper signed by the broker, please contact your account manager to request such a report. Please note that the Account Summary takes the last mid price to calculate the P&L. If your authorities require to use any other price for the report, please contact your account manager and request the report that would strictly stick to the requirements. Please be aware that our account managers cannot assist you in finding out the tax requirements applied to you. In order to calculate the margin requirement of a given portfolio, EXANTE uses an in-house risk management system, a variation of SPAN®, the Standard Portfolio Analysis of Risk. The SPAN® methodology consists of a series of portfolio "what-if"-scenarios that yields the worst possible performance loss a portfolio can suffer over a specific time horizon. To do this, SPAN® uses a predefined set of parameters reflecting the market conditions of traded contracts. Margin call is the term when account value (ie total deposits plus or minus any profits/losses) falls below margin requirements. Margin call is initiated once the Margin Utilization reaches 100%. In this situation client will be prevented from opening additional new exposure but will be able to keep the existing positions as long as the margin utilization is below 100%. Should the margin utilization exceed 100%, the client will be in breach of margin requirements and EXANTE will have rights to decrease or fully liquidate client’s open positions at any moment. It is a client’s responsibility to keep enough funds to fully cover margin requirements of open positions. Margin Utilization is the percentage of margin collateral that client is utilizing for margin products trading. If the margin utilization exceeds 100% there is a risk that margin positions will be stopped out (ie reduced or liquidated). Margin Utilization is calculated as = (100 * Used for margin) / (Account value + Other collateral – Not available as margin collateral). 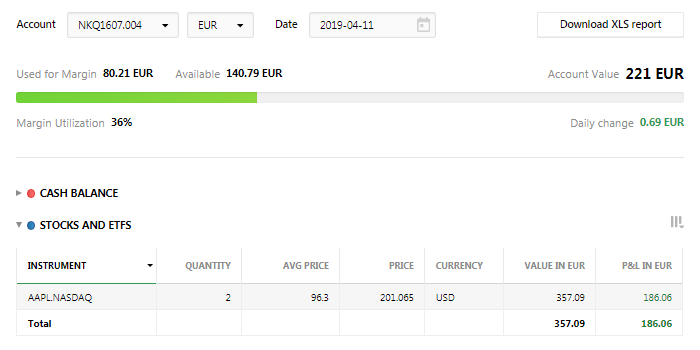 Margin report is a module in EXANTE ATP which helps you track not only the total sum and proportion of leverage, but also the entire structure of the current margin. EXANTE demo account does not have an expiration date, so you can use it as long as you want. If you lose access to your demo, you can easily restore your credentials and re-download the application from the clients area on our website. If you run out of virtual funds on your demo account, visit the Settings page in the Client's area. Demo account will be available to you as soon as you sign up and set a password.